It is time for a proper newsy letter from me to let you in on the studio life. We have had so many changes in the past year. We have three new staff people, two of whom are named Angela. We also hired Logan as a studio assistant and dyer. It was a big change for me to see both Denice and Georgina move on. I get accustomed to and care for the people I work with everyday and I feel a loss when they leave. I do find though that new people bring new ideas and possibilities and that change is always happening and I have to get used to it. Angie, Angela, and Logan are all good company, hard working, and I am happy to have them. They are all really creative, and love making rugs. This year I got used to having my own office and studio space in the back room of the studio. I think it has been good for me and my work. I finished a new book called, “Making a Life: Twenty Five Years of Hooking Rugs” which will come out in the spring. I also made some of my favorite rugs ever. It has been a good move. I get to talk to lots of people as I can see everyone through the glass doors. We had several thousand visitors last year. Our online course was a blast and more people enrolled in it than ever. Yes, I am doing an online course this winter and we are going to announce it very very soon. Last years’ was so great. I kept seeing beautiful pictures of Impressionist Floral Gardens on Wild with Wool. Our facebook group Wild with Wool has grown to nearly 5000 members. This newsletter has grown to over 9000 members. Sometimes I can hardly believe it. Thank you for all that support . I appreciate it so much. As of October this year we served over 2100 oatcakes to studio visitors.I think we were close to 2500 for 2018. I love it that people sometimes just drop in for an oatcake, or that a woman will take them to her husband or kids waiting in the car as a thank you for waiting. The studio is supposed to be a welcoming place and it is important to all of us there to offer people a little snack, and a cup of tea. Our most recent club, the Paper version of the Pattern of the Month Club is growing quickly. As it is only $9.95 a month. At first I had no idea if it was a good idea but the response has shown me that people want a paper version because they are easy to store, you can enlarge them, and it is less expensive. You can join here. I just finished one my favorite rugs ever. I spent a full day this week clipping and pressing it. It is called Three Moose and The Seven Sisters. It has turned out to be strong and richly coloured and I think that I will get it hung in the studio next week. I hope you get there to see it. I will share a full picture of it soon. Oh and the Good News about the Blundstone Boots…..Someone on this Newsletter List will win a pair of Blundstone Boots next October. You choose the size and the colour. You have to stay on the list to be eligible to win so stick around and you might just be the winner of a pair of these great boots that we sell at 30 Church Women’s Clothing across the street from the studio. So that is all the news from me. I am glad you are there. Our Paper Pattern of the Month Club is a variation of our Pattern of the Month Club that allows you to receive our POM on paper! That means you can enlarge them and make them bigger or just transfer them on to the backing of your choice just as they are. I have been thinking of trying paper patterns for a long time and in the last year many customers have been asking for it so I am going to start here and I am excited about it. Delivered to your doorstep monthly, it will be a unique and one of a kind pattern designed by Deanne ( that’s me!). These patterns are on paper and are perfect for a few key reasons: Not only can you transfer them to the backing of your choosing, but you can transform them with ease by enlarging them or reducing them at your leisure! Like our other subscriptions, our Paper Pattern of the Month comes with the added benefit of free access to Woolcake, our private online membership!Think of having these hooked designs ready for gift giving, to create pillows, or to frame as art. Sign up today and for a monthly fee of $9.95 CDN, $7.40 USD, and let the inspiration take hold! The possibilities are endless when it comes to creating beauty every day! 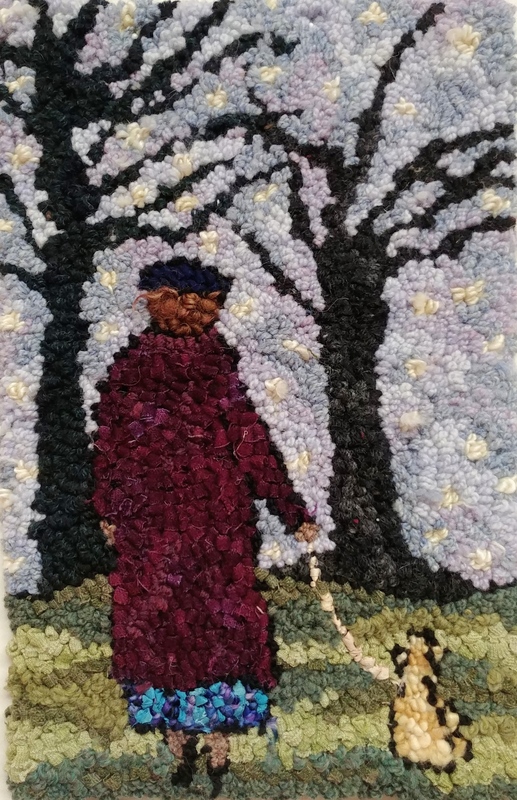 Join me, Deanne Fitzpatrick, to learn about creativity , art and rug hooking. This site is where I keep a journal about my rug hooking. I update it frequently and discuss my creative process, my ideas about art, beauty, life, creativity and rug hooking. It is the place where I go to write on a regular basis, to sort things out and understand my own work. The site is full of how to videos, podcasts, articles, tips and learning from Deanne in her studio. New content is added four times a month. Join Woolcake for a fresh perspective on a traditional craft. One that instills in you the joy of making and keeps you inspired and wanting to hook wonderful rugs. Think innovation,think joy, think rughooking, think Woolcake! and it is only 34.95 a year, the price of monthly coffee! P.S. If you are already a member of Woolbox or Pattern of the Month this subscription is included in your membership.